Say “Hello!” to our new Audiovisual Preservation Specialist! Rosie Rowe is the Audiovisual Preservation Specialist for Special Collections & University Archives (SCUA) at Parks Library. Rosie has more than 20 years of experience in audiovisual fields and has worked extensively with the preservation of analogue and digital media formats. In her previous role as the Audiovisual and Film Specialist at Archives New Zealand, she was responsible for building and maintaining a new audiovisual lab, where they preserved more than 20TB of at-risk, historical media for the national archives. 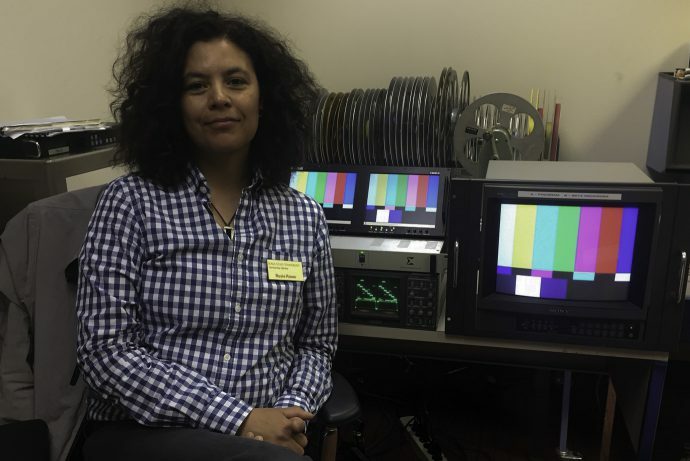 She aims to provide similar guidance and preservation workflow to the film and audiovisual collections at SCUA. We are very pleased she is here. Please join us in welcoming Rosie! A trip to your local craft store will tell you that scrapbooking is a popular American activity. But this is not just a recent phenomenon. In fact, scrapbooking has been popular for the last century or more, and this is made evident by the number of alumni scrapbooks we have here in the University Archives. Scrapbooks provide a unique window into the history and culture of a time period. They save many of the things that would otherwise be lost to time, such as newspaper clippings, dance cards, theatre programs, and flyers. 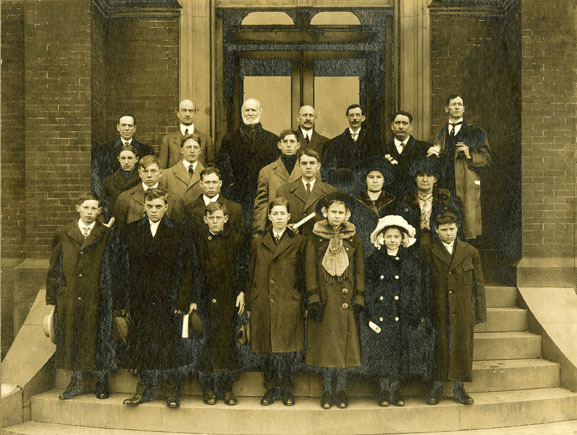 Early 20th century Iowa State College students, like many of their cohort around the country, kept scrapbooks to capture their experiences and memories of the fun times they spent outside of classes. 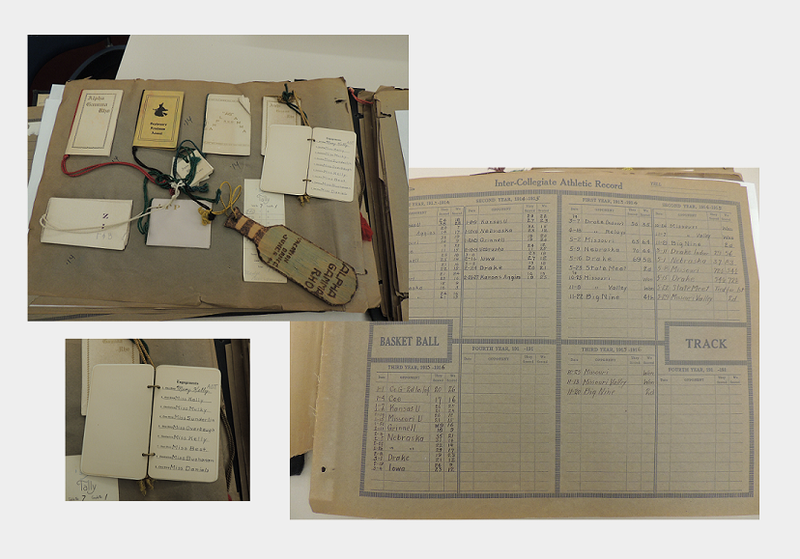 Pages from the Raymond T. Benson Scrapbook, RS 21/7/81, showing dance cards and sports score charts, circa 1913-1919. Scrapbooks also capture the larger historical and cultural environment in which the individuals lived out their lives, such as the scrapbook below from Mary (Graf) Speer, who attended Iowa State College in the 1940s. The first page of her scrapbook includes a newspaper front page headline proclaiming victory in Europe during World War II–obviously a huge concern to the students of the day, who had friends and family members fighting both in Europe and in the Pacific Theater. From Mary E. (Graf) Speer Scrapbook, RS 21/7/250, 1945. Raymond T. Benson’s scrapbook from World War I documents the military activity on campus. Page from Raymond T. Benson Scrapbook, RS 21/7/81. Scrapbooks also present unique challenges to archivists in terms of storage and preservation. Because scrapbooks often contain 3 dimensional objects, this can strain the binding, as with Raymond T. Benson’s Scrapbook below. Cover of Raymond T. Benson Scrapbook, RS 21/7/81. While the photograph above shows a scrapbook placed in a box to protect it, other scrapbooks required more extensive housing treatments. Mary Graf Speer’s scrapbook came to the archives missing a cover, so spacers were placed inside the box to keep the individual pages together, while some material was removed to a separate folder. Mary E. (Graf) Speer Scrapbook, RS 21/7/250, in box with spacers and separated material in folder. Sometimes a scrapbook needs special treatment, not because it is in bad condition, but in order to keep it pristine. Lottie M. Rogers, who attended Iowa State College in 1901-1902, created a beautiful scrapbook. Library conservators created a special box to maintain it in its originally beautiful condition. Lottie M. Rogers Scrapbook, RS 21/7/149, circa 1901. Box created to house the Lottie M. Rogers Scrapbook. More alumni scrapbooks and other papers can be found in RS 21/7, Alumni and Former Students. On June 6th, I attended the Iowa Conservation and Preservation Consortium’s SOS (Save Our Stuff) conference with colleagues Hilary Seo, Head of Preservation, and Mindy Moeller, Conservation Technician. 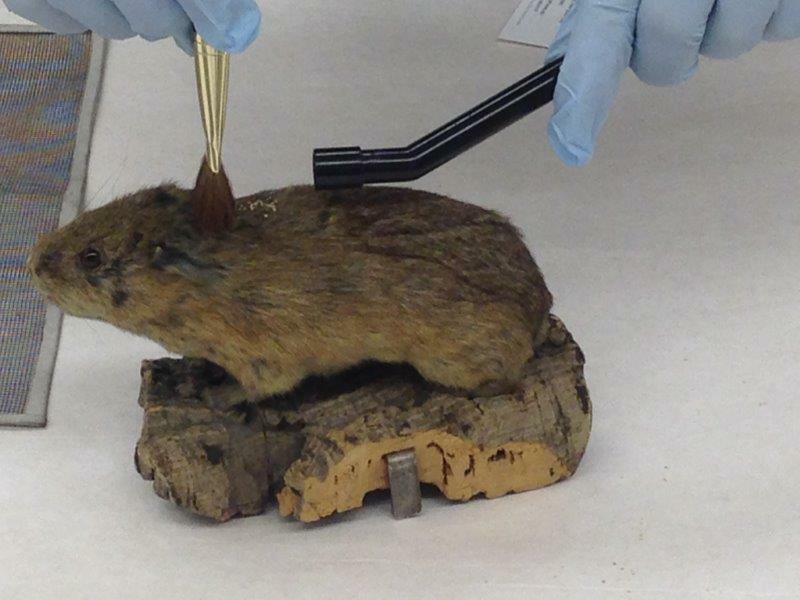 Mindy’s take on the conference can be found on the Preservation Department’s blog, as well as a feature by Hilary on the taxidermy session. I’m here to provide an archivist’s perspective on the conference. Being an archivist, I know a bit about preservation and conservation, but I am not trained in and therefore don’t perform the intensive preservation and conservation work that some records need, so I was interested in learning more about the view from the other side of the fence, so to speak. The first session I attended was “Thinking Inside the Box” lead by Kären Mason, Curator, and Janet Weaver, Assistant Curator, of the Iowa Women’s Archives. All of the creativity and effort that goes into boxes made for storing items that require special housing is amazing. I imagine it would be a fun, but challenging, task. During the session, we got a brief tour of the archives and were given a chance to look at all of the different rehousing solutions that have been created for the IWA over the years. Some were quite intricate and highly specialized, and others were “make-do” solutions (for example, storing plaques in record center boxes or creating housing for a large, fragile photo from archival cardboard). In both cases, a great deal of creativity and resourcefulness was clearly involved. Below are some examples of the more intricate solutions created. A box made to keep this geisha doll and her enclosure safe. A box specially made for this pin – note the piece created to stick the pin through. Special housing created for a Daytime Emmy. The next session was “Taxidermy Care and Cleaning” with Cindy Opitz, Collections Manager of the UI Museum of Natural History. This one I attended out of sheer curiosity. I have never worked with taxidermy animals, and I suppose I’m not likely to unless I someday work in a museum. All the same, it was fascinating, and the best part was we got to do some hands-on work on cleaning some animals. We learned about equipment used, equipment and chemical solutions not to use, how to use equipment, and ideal and non-ideal conditions for storing taxidermy animals. Should taxidermy animals ever come into my possession, I now know how to care for them! Below are examples of the specimens we got to work with and the cleaning that was performed. An attendee vacuuming a small mammal. 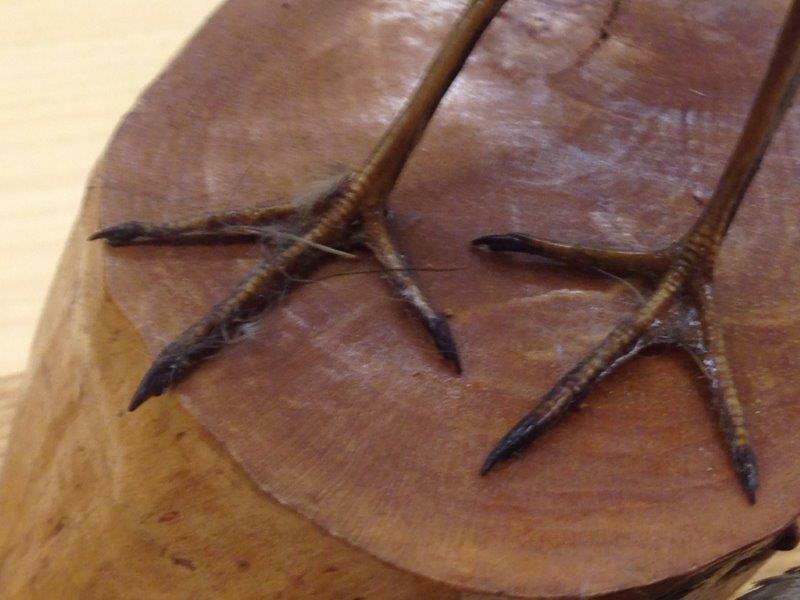 Bird feet ready for cleaning! My attempt at cleaning dust from the eye of a bird. Finally, I attended a session entitled “Mold Incidents and Response” presented by Nancy Kraft, Head of Preservation and Conservation at the UI Libraries. This was particularly practical for me since mold is something I have come into contact with and likely will again. While I already knew a bit about mold in books and archival materials and how to handle them, I didn’t have a good grounding in how they are actually treated. Again, unless it’s something simple and not too risky, we outsource preservation work to conservators, as they are trained to deal with these things. It was interesting to learn a bit more about what actually goes on and how things should be handled. Some topics covered were the proper initial response to mold, identification of mold (for example, active or inactive), how to get rid of mold, how best to choose a vendor for treatment if needed, and some basic safety precautions. There were no examples of moldy items passed around – a bit of a health hazard – so a photo of mold found on library books in another university is featured below. Overall, I think the conference was valuable even though I don’t personally perform these duties, at least not to the extent conservators do. In our increasingly collaborative field, it’s important to know about and understand what the people we commonly work with do and their opinions on issues. This helps us to better communicate with each other and to prioritize issues to be resolved. Someday I may be the only archivist at a small institution with an even smaller budget, in which case I may find this information especially useful, for example in determining questions like the following: What can I reasonably do myself? To whom should I outsource things that I can’t do? What’s a creative and cost-effective way to solve this preservation problem? We archivists always have preservation in mind when we organize and make materials accessible, but conservators greatly help us to extend – and often save – the lives of our materials. For the past few years, the Iowa State University Library has subscribed to the Archive-It service for the long-term preservation of university web content. Archive-It is a web site preservation program that allows institutions to select and permanently capture html-based web pages. Created by Brewster Kahle and the Internet Archive, the goal of Archive-It is to save born-digital information on web sites and to serve as a web archiving tool. In 2008, Archive-It introduced a special program designed for K-12 students to preserve digital information. The goal of the K-12 Web Archiving Program was to educate students about not only what web sites should be saved for future research, but how would you choose what to preserve? Currently in its second year, 15 schools in 13 states participate in this competitive program which allows students to learn how to make these decisions and “help them to develop an awareness of how the Web content they choose will become primary sources for future historians studying our lives,” according to the program’s web site. Special Collections and University Archives Head Tanya Zanish-Belcher saw the call, and forwarded the request on to Sarah Passonneau, Assistant to the ISU Library Dean and recommended that Ames Middle and High Schools consider applying. Sarah worked with Dr. Lance Wilhelm (Technology Director at the Ames Community School District), to complete the application, and Ames was one of nine community schools selected for the project. For more information about Archive-It, see the vendor’s FAQ and additional information at http://www.archive-it.org/. To see ISU’s preserved web sites, please go to: http://www.lib.iastate.edu/spcl/collections/webarch.html. Last week a number of us here in the Special Collections and Preservation departments at Parks Library, in addition to other archivists and private collectors throughout the Midwest, attended a Care and ID of Photographs workshop presented by photograph conservator Gawain Weaver. The workshop was full of information on the history of photography and photographic processes, and identification techniques. The four-day workshop was hosted here at Parks Library, and a summary of the the workshop can be found at the library’s preservation blog. Gawain Weaver discussing the dye layers of various chromogenic (color) photographic materials. What we learned in the workshop can now be put to good use with our collections. In putting together this post, I tried to find a few examples of older photographs in our collections. Most of what we have are silver gelatin prints, but older photographic processes are also in the mix. For instance, many of the early images of campus are on glass negatives. 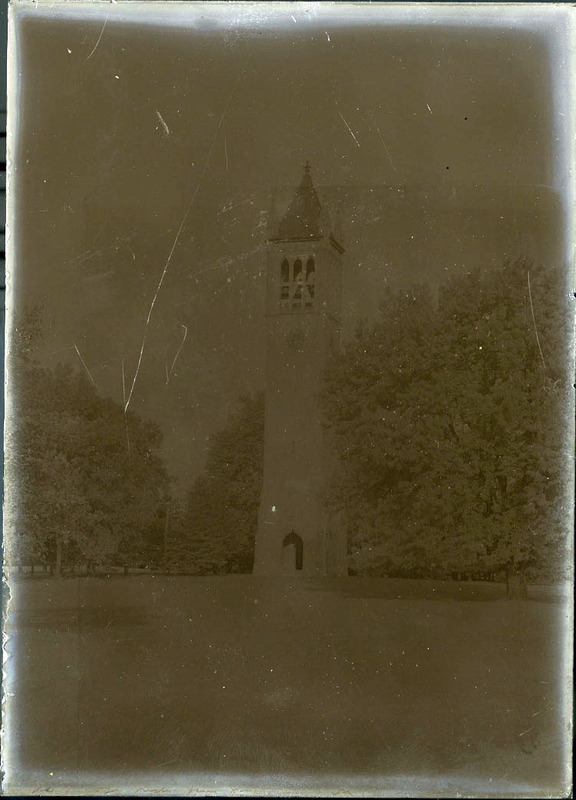 Below is a dry plate negative of the Campanile, probably from 1912. The date is barely discernable on the negative, but with the scan one can zoom in to the date scratched at the bottom of the plate. I scanned the negative first as a positive so the features of the glass negative could be seen more easily. The dry plates, which came after the wet-collodian negative process (for the basic steps of this process, visit the George Eastman House’s description), were a very important invention in the history of photography. For instance, unlike the wet-plate negatives, they could be bought ready to use from a manufacturer, were more sensitive to light and so needed less exposure time, and did not need to be processed immediately. The same glass negative scanned as a negative, and seen as it might appear if a print was created from the negative. Above is a box which contained manufactured dry plates from the M.A. Seed Dry Plate Company. Extension. Caption reads "Washington Party, 1912"
The glass negatives were used to produce photographic prints. To the right is a silver gelatin print from develop-out paper (DOP), also from 1912. This photograph was developed by briefly placing the negative on the paper, and then completing the development process by using chemicals. Previously, many photographs were developed using printing-out paper (POP) by exposing the negative, placing the negative on the printing-out paper, and then exposing the negative and paper to light for a period of time. The Washington Party image above, and the image to the right of a 1910 domestic economy cooking short course, both show evidence of something called silver-mirroring. Silver-mirroring is one of many good reasons that archival collections are stored in a temperature and humidity controlled environment. Environmental factors, such as heat and humidity, can cause a variety of damages to photographs. The Special Collections reading room should be one of the cooler areas in the library throughout the year, and the storage areas have even lower temperature and humidity levels. Glass plate negatives, silver mirroring, identifying silver gelatin DOP prints, and caring for photographs were just one of many topics covered during the workshop. I can honestly say that it was one of the most enjoyable and informative professional development opportunities I have had, and it took place here at our own Parks Library! This week (May 9-15) is the American Library Association’s first annual Preservation Week. In honor of preservation week, the library’s preservation department has selected and shown a variety of preservation related videos for staff here at Parks Library. To find out more about these videos, please visit the preservation department’s blog. Most of the films are available for viewing on the web. The American Library Association has also provided links to a variety of preservation-related videos. Below is an amusing video, also available on the ALA website, from Kansas State University Library demonstrating simple steps one can take to help preserve physical materials…and hopefully makes it clear why visitors to the Special Collections Department are not allowed to bring food and drink in with them! The Special Collections Department works very closely with our preservation department to make sure that our collections and rare books will be around for generations to come. However, it is also important for these documents and books to be well-cared for before they come to our department, and it is not uncommon for us to receive questions from patrons on suggestions for storing and caring for artifacts and documents people wish to preserve. The American Library Association has put together a wonderful listing of useful websites to help answer these questions, and if you’re interested in preserving your materials or would like to find out more about conservation work, I highly recommend you visit at least a few of these sites. Most of the sites provided address the preservation of physical objects. However, since computers have become an often vital aspect of our daily lives, the preservation of digital files has become more and more important. The Library of Congress provides a guide for people to preserve their digital files in a variety of formats, including e-mail, digital images, videos, audio, and websites. Below this guide are a variety of additional resources including a video, slideshow and quiz. And if you would like to find out about how professionals are grappling with the difficult issues of digital preservation, the menu at the left provides links to video and audio discussions, in addition to other resources. One way the Special Collections Department is preserving digital information is through Archive-It, a web preservation program. You can view preserved websites of Iowa State University here.